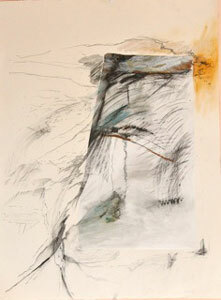 The work in this show "Faultlines/Maps” is a series of paintings and prints,that are landscape like in their imagery. A metaphor for vectors where earth meets ocean, desert connects to mountains or the tension between planetary plates. Simultaneously, a place, a journey and a mental concept. They are each a recording of a moment which can never be repeated. A visual description of places seen and unseen. An attempt to simultaneously be in and with the flow of life.There is a resonance of color and spontaneity that evokes zen brush painting. An acknowledgement between the ephemeral and the permanent, or between life and death.